With a damp paper towel, lightly wipe debris from mushrooms and remove stems. Pulse mushrooms in food processor (in batches). Set aside. Pulse onions in food processor until fine. Set aside. Mushrooms have been a staple in the diet since ancient times. They are neither fruit nor vegetable, but a fungus. They are self-sufficient in nutritional development because they gain their nutrients from metabolizing non-living organic matter. Mushrooms are the perfect food due to their naturally low sodium levels, zero fat and cholesterol, and are gluten-free. White button mushrooms are the most popular because of their very mild flavor. These are found mostly in salads, pizza toppings and mushroom sauce. Crimini, or “baby bellas” are small brown mushrooms that offer a deeper flavor and usually accompany a pork or beef dish. They are also often found in Asian dishes. Shiitake mushrooms are on the opposite end of the spectrum of white buttons. They offer a deep woodsy flavor and are often used as a meat substitute in vegetarian dishes. For many, it’s a habit to check the fat, protein carbohydrate and vitamin contents of a food, but we rarely check the trace mineral values of a food. Trace minerals are required for our bodies in maintaining healthy fluid balances, regulating hormones, regulating blood pressure and more. This recipe features finely chopped mushrooms. 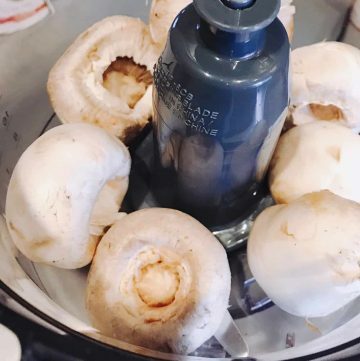 For larger bites of mushrooms, do not put in food processor but course chop mushrooms. Chicken and beef broth may be substituted for vegetable broth. Beef broth and shiitake mushrooms create a deep, savory flavor. Chicken broth and button mushrooms create a lighter flavor. A deeper, more creamy version of this soup may be obtained by incorporating a white roux. Roux: French term for thickening agent. A combination of fat, flour and liquid. What are the secret ingredients? Let me know what you think… Hint: there are two and they are sisters….”Sugar” and “Sherry”.